After spending more than half of last season (43 games) with the New Jersey Devils you couldn’t blame Nick Lappin if he was supremely disappointed when he was one of the final roster cuts before the NHL season started and began the 2017-18 season in the AHL with the Binghamton Devils. Instead of going to the minors and sulking, Lappin made the most of the opportunity and earned himself a brief recall this past week with New Jersey in need of a winger. Both of his games were remarkably similar: two shots on goal, 15 shifts/10:02 of ice-time at Montreal, two shots on goal, one goal, 13 shifts/10:11 of ice-time vs. Dallas. He played on one of the two bottom lines with New Jersey (often alongside Brian Boyle and Jimmy Hayes) after playing top-line minutes and all special teams with their AHL affiliate but no matter which Devils team he’s suiting up for, you’re going to get the same effort. 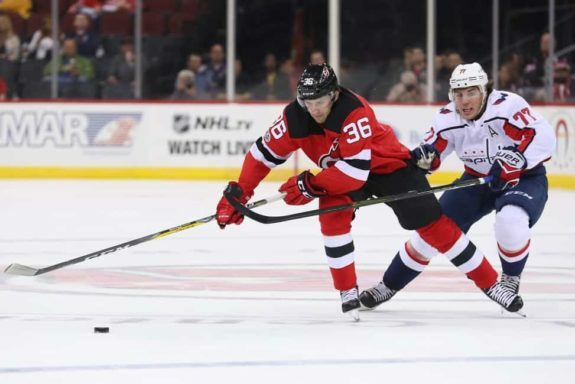 With the team in New Jersey (finally) nearing full-health Lappin was sent back to the AHL after the Dallas win, as they expect Taylor Hall, Kyle Palmieri, and possibly Marcus Johansson to make a return to the lineup this upcoming week. Perhaps most importantly, the team secured three out of four points on back-to-back nights without three of their top-six forwards out of the lineup, and a big part of that is Lappin’s acceptance of his current role in the organization. On the scoring play, Lappin fired the original shot from the face-off circle and then made his way to the slot where it was between all five opposing players that he found and slipped the loose puck past the goalie. “We were coming off of the bench and Boyler had a good step on a guy, he saw me coming towards the net and tried to hit me there. The goalie made a pretty good play getting his stick out, but I was able to jump on the loose puck in the corner,” he explained. “It doesn’t really matter who you play with, you just have to play your same game,” he added. “You develop a little bit of chemistry with certain guys – like I’ve played a lot with Bracken Kearns for most of the time down there and we’ve been doing pretty well together.” Kearns is second on the team with 20 points. 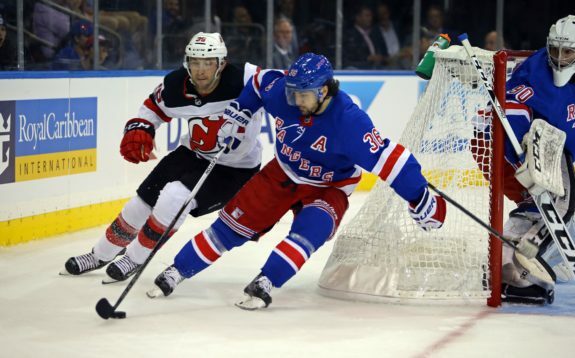 Lappin will be back again with the big club in New Jersey, and barring injury you can bet that this won’t be the last we see of the Brown University grad in the NHL this season as the Devils attempt to make the playoffs for the first time since 2012. Hynes and GM Ray Shero wanted to build a team that was Fast, Attacking, and Supportive – and the 25-year-old from Geneva, Illinois fits that description perfectly.